Cytosport’s Monster Milk supp mix gives you an all-in-one workout solution. Previous story Do Float Tanks Help With Recovery? Next story Are Multivitamins Worth Your Money? By now you almost certainly know that you need a serious protein supplement to fuel your most serious workouts. But the choices are numerous in today’s market, and it’s hard to find one that includes pretty much everything you need in a single product. This is where Cytosport’s Monster Milk All-in-One Muscle Recovery Protein Supplement Mix comes in, because it’s more than simply a rich source of pro­tein—it’s an NSF Certified for Sport all-in-one formula that can fuel you during every stage of your routine. And it can help you maintain and recover long after you leave the gym. While many products peak at 30 or 40 grams of protein per serving, this product features an ultrapremium combina­tion of whey and casein that packs a punch of 50 grams of protein per serving. But it’s not just the protein boost that’ll fuel you: It also has 3.3 grams of creatine monohydrate per serving, which can help you build even more muscle mass and strength. Probiotics have been proven to have tremendous potential in supporting intestinal health, as well as overall immunity. 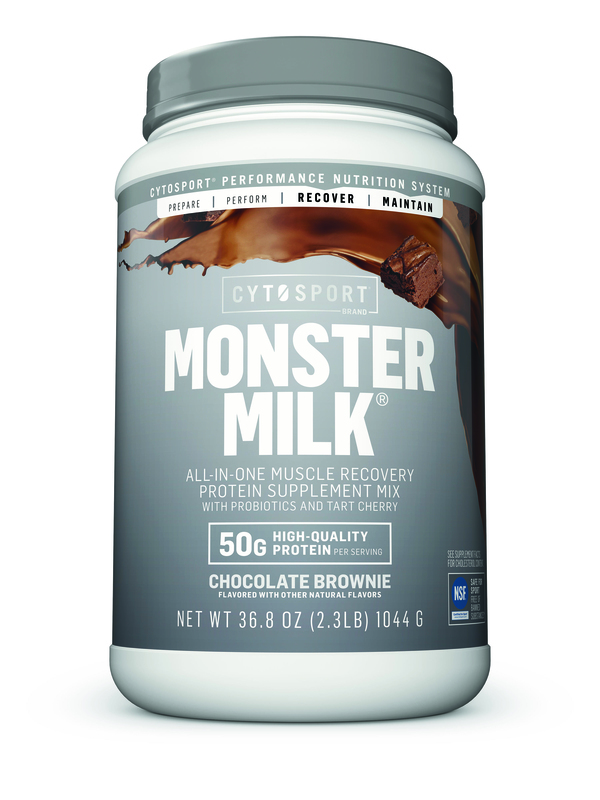 But there’s no need to shell out for a separate (and often pric­ey) supplement—Cytosport’s Monster Milk protein also has your gut covered: It contains 1 billion CFUs of DE111 probiot­ics, a clinically studied strain of Bacillus subtilis that can help feed the good bacteria you need to stay healthy. Monster Milk protein also con­tains 5.5 grams of L-glutamine per serving. What’s more, it’s got a blast of leucine from intact milk proteins. Those key amino acids can trig­ger muscle growth and help prevent muscle protein breakdown. This supplement also gives you 500 grams of tart cherry powder per serving, which can accelerate muscle recov­ery and support connective tissue—and may have anti-inflammatory properties. Monster Milk supp mix is a gluten-free, soy-free, all-in-one power boost with no artifi­cial flavors or artificial colors. One serving (two scoops) offers a whopping 50 grams of whey and casein protein. Few other supplements on the market provide such a huge blast of protein in a product that also tastes amazing.